Neurons communicate with each other via chemical messengers known as neurotransmitters (NTs), and these can either be excitatory or inhibitory. An excitatory NT causes the communicating neuron to ‘fire’, whilst an inhibitory NT causes it to be inactive. The most common excitatory and inhibitory neurotransmitters in the brain are glutamate and GABA respectively, and a very fine balance between the two must be maintained for normal brain function to occur. Too much excitation (either because of an increase in glutamate or a decrease in GABA) can cause neurons to become hyperactive and seizures can result. Electrical current in neurons is generated by the flow of ions, including potassium and chloride, through structures known as ion channels. Potassium ion channels include many subtypes and together they are one of the main regulators of neuronal excitability. A potassium channel known as Kv1.1 also controls the release of glutamate from neurons, and its malfunction has been linked to over-release of glutamate, an increase in brain excitability and epilepsy development. Chloride channels are usually inhibitory, and they act by allowing chloride ions to enter a neuron, making it more difficult for the neuron to fire. Loss of these channels has also been associated with certain types of epilepsy. If a loss of/defect in chloride or potassium ion channel function is associated with epilepsy susceptibility, can an increase in their activity treat or even prevent epilepsy? In a recent study that was part-funded by Epilepsy Research UK, scientists at University College London (UCL) explored this question, using advanced genetic techniques involving viruses. Viruses have special mechanisms by which they can incorporate their DNA into the cells they infect, and scientists can use them as vehicles (known as vectors) to transfer genes, e.g. ion channel genes, to cells. Provided that a gene is incorporated successfully into the host cell DNA, it can encode a protein (e.g. an ion channel) that functions normally. This technique can only be performed using certain types of virus that have been genetically modified to make them less harmful; however it is a very useful tool in examining gene and protein function. The researchers at UCL wanted to find out if it was possible to stop seizures in rodent epilepsy models, very soon after they had begun, by increasing the number of chloride channels in their epileptic neurons. 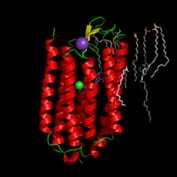 They chose to use a special type of chloride channel known as halorhodopsin, which is found in certain bacteria and is activated by a specific frequency of light. Halorhodopsin is encoded by a gene called NpHR. After having induced epilepsy in the animals with a special toxin, and identified the seizure focus (the region in which seizures originate) in each using wireless EEG; the scientists injected the seizure focus of each animal with viral vectors containing NpHR. Seven to ten days later, they used optic fibres to deliver light of the appropriate frequency to the NpHR-treated neurons, in order to activate the halorhodposin channels that had formed. They found that seizure activity in all animals decreased dramatically upon channel activation. The team then wanted to find out if seizures could be prevented from occurring in animals treated with toxin, by increasing the number of Kv1.1 channels in their neurons. In order to do this, they used a vector to deliver the human gene KCNA1, which encodes Kv1.1, to the animals’ brains, and administered the epilepsy-inducing toxin at the same site, at the same time. They then monitored the animals both visually and via wireless EEG for seizure activity, and found that it was completed prevented in these animals. Finally, the scientists explored whether or not an increase in Kv1.1 activity during well-established epilepsy could reverse (cure) it. Again, they induced epilepsy in a group of animals, and after a week they delivered KCNA1 to the neurons in their seizure foci. The team noticed that both the frequency of seizures experienced by the animals and the seizure activity in their brains gradually decreased, and stopped completely after four weeks. These results (although early) are extremely promising, because they show that it is possible to prevent and even cure epilepsy in living mammals using KCNA1 and NpHR gene therapy. If this approach is validated in human trials, it could revolutionise the treatment of epilepsy. In the future, it might even be possible to incorporate NpHR therapy into a device that detects early seizure activity in neurons and inhibits it with light, before a clinical seizure develops. If combined with longer-term seizure suppression via KCNA1, a very effective treatment could result. It is still the case that a third of people with epilepsy do not respond to anti-epileptic drugs, and as epilepsy surgery is only feasible for a small proportion, these findings are very welcome.